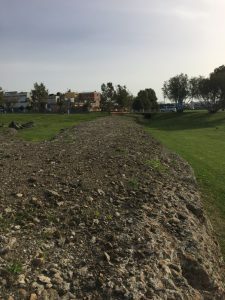 Excavations of the northern mole of the Claudian harbour began in 1957 with the construction of the international airport of Leonardo da Vinci at Fiumicino (for a news report of 1959 see Archivio Storico Luce). The work was recorded in great detail by Otello Testaguzza (Portus: illustrazione dei Porti di Claudio e Traiano e della citta di Porto a Fiumicino) revealing both the different types of construction technique used to build the mole as well as it’s trajectory westward into the open sea. Over 800m of the mole was revealed, parts of which are still visible outside the airport today. 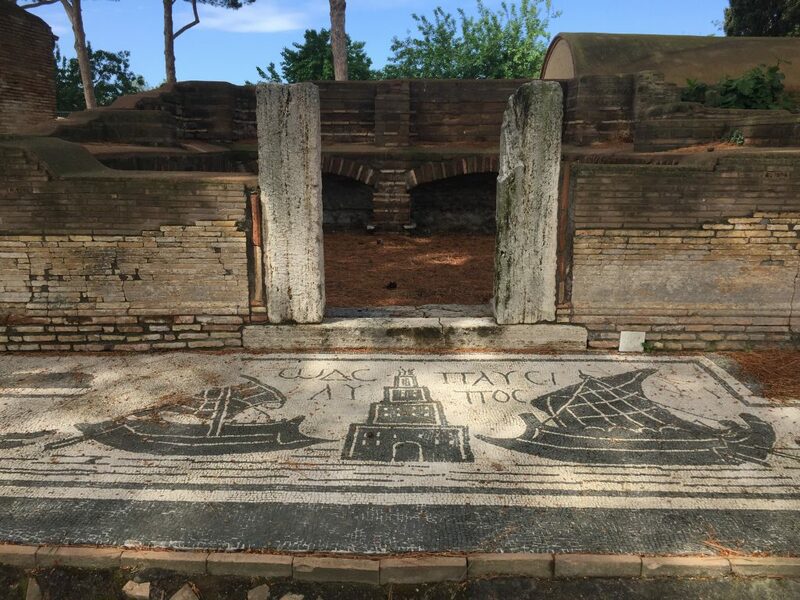 More recently research has been conducted by the Parco Archaeologico di Ostia Antica (ex Soprintendenza per i Beni Archeologici di Ostia) to trace the continuation of the mole towards the hypothesised location of the great lighthouse. Published in the BSR monograph Portus and its Hinterland in 2011 , the work involved a series of cores in the area of Pesce Luna (immediately to the west of viale Coccia di Morte) and was successful in locating a spread of construction material westward from the road. 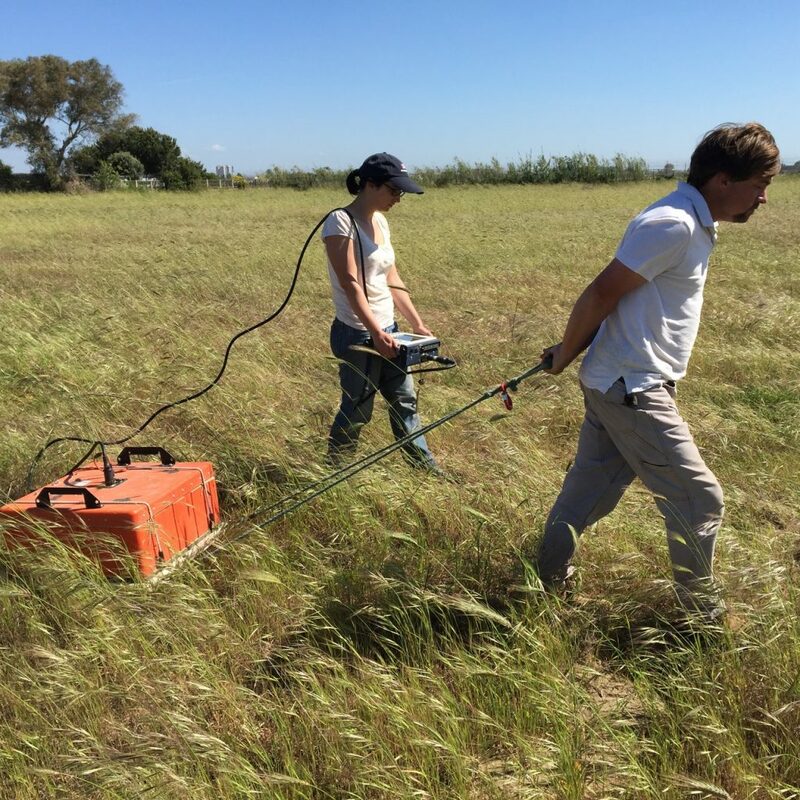 In 2016 the Portus Project conducted a first season of geophysical survey in the same locality with the aim of using Ground-Penetrating Radar to follow the course of the mole, as indicated by the earlier research. The GPR survey did not record a single continuous anomaly as had been hypothesised, but rather a series of interspersed concentrations, suggesting the possibility of later spoliation or a different form of structure. A second season of geophysical survey was undertaken in 2017 using the technique of Electrical resistivity tomography (ERT) to further investigate at a greater depth the discontinuous anomalies recorded by the GPR. A total of 24 straight profiles were collected, divided equally in two areas of investigation. Each profile measured 128m with a linear spacing of the electrodes at 2m and a traverse spacing of 4m. The results of the pseudo-sections were then used to guide the placement of 3 new geo-archaeological cores to test the results, one directly above a large feature recorded by the ERT. The combination of the techniques revealed that the northern mole is preserved at a depth of approximately 9m and continues to a depth of 15m. This spring a final season of ERT will be conducted with the aim of completing the coverage from Viale Coccia di Morte westward towards the lighthouse. Whilst the earlier work of Morelli et al (2011) had provided the approximate location of the mole, the aim now is to understand whether the mole was one continuous structure or perhaps built with a series of arches resting on piers. Morelli, C., Marinucci, A. and Arnoldus-Huyzendveld, A. Il Porto di Claudio: nuove scoperte, in S.Keay and L.Paroli (eds) Portus and its hinterland, Archaeological Monographs of the British School at Rome 18, 2011: 47-65. Testaguzza, O. (1970) Portus: illustrazione dei Porti di Claudio e Traiano e della citta di Porto a Fiumicino. Rome, Julia Editrice.